Hair loss may be attributed to a number of causes, including wrong grooming practices and poor diet. However, the most common reason for hair loss, especially among men, is androgenetic alopecia, also known simply as alopecia, or more popularly as male pattern baldness. 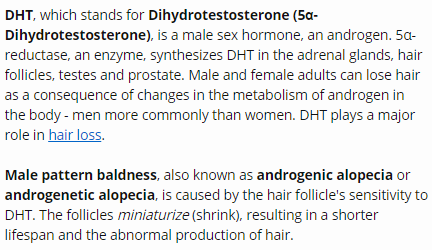 Alopecia arises from the effects of a hormone known as dihydrotestosterone (DHT) to hair follicles. DHT is a male hormone, but is also present in women in smaller amounts. This is why hair loss is more common among men.